This week the SicKids team are in Cambodia supporting the health and wellbeing of children and young people in and around Sihanoukville. 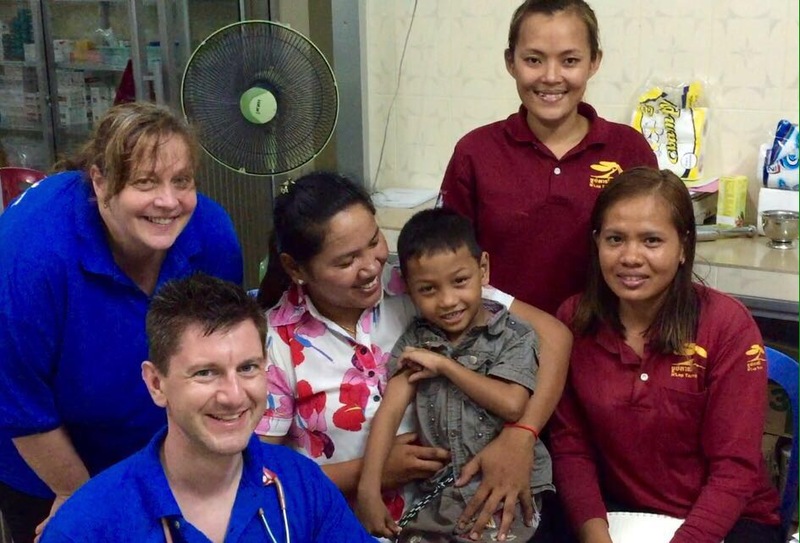 Today Dr Andrew Rowland and Nurse Sue Higgins were delighted to welcome back Samnang* to their clinic. He was last seen in clinic during Andrew’s last visit to M’Lop Tapang in November, with severe developmental delay. With the brilliant intervention of the health and education team at M’Lop Tapang, and his mother, Samnang has demonstrated a fantastic improvement. Pictured with Sue and Andrew are Samnang and his mother, along with members of the specialist health and education team at M’Lop Tapang. As a non-profit organisation, M’Lop Tapang is the only project we’re aware of in the region with such a team. Samnang’s progress is testament to their great work and dedication. 1 Pings/Trackbacks for "Brilliant results from M’Lop Tapang’s education team"